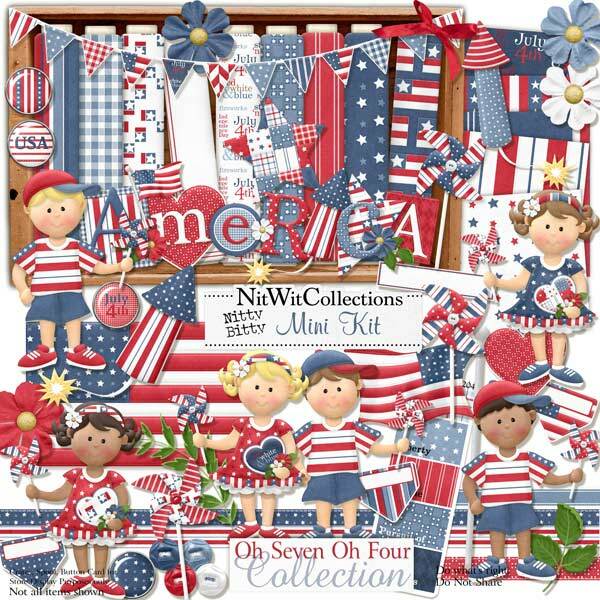 Nitty Bitty "Oh Seven Oh Four" Mini Kit is a July 4th American Independance day kit to celebrate the birthday of the United States of America! This mini kit will give you all of the necessary elements and papers to create layouts and cards in true patriotic form! Flags, the kids, party accoutrements and even firework rockets will help you to celebrate the memories of this day. 4 Resin drops - don't miss the USA and July 4th ones for easy placement! 1 Wordart - "America" - how fitting, don't you think? ?